New research shows that artificial intelligence (AI) can help scientists in fields such as oncology and regenerative medicine control complex biological systems to reach new and previously unachievable outcomes. At Tufts University, treating frog embryos with three reagents selected by an AI model resulted in something never before seen: a loss of concordance among pigment cells (melanocytes) undergoing metastatic conversion. 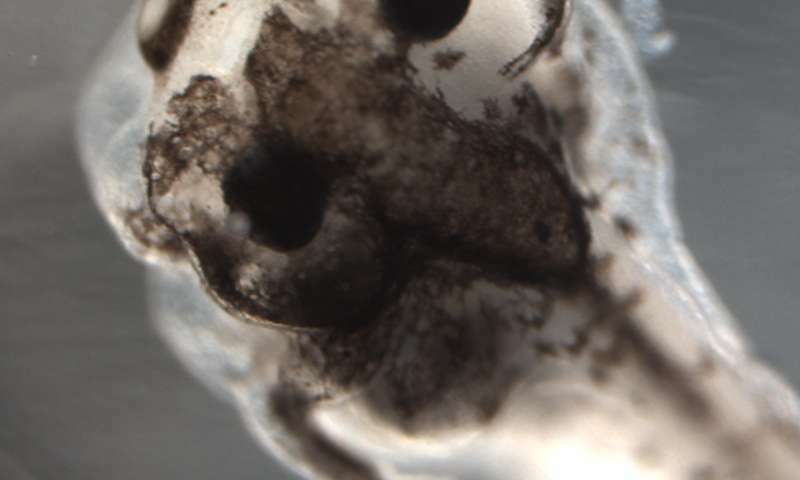 In embryos treated by this unique set of reagents, pigment cells in some areas of a single tadpole converted to an invasive, cancer-like form (tissues over the left eye above) while other regions in that tadpole remained normal (tissues over right eye above). This is the first time an artificial intelligence system has been used to discover the exact interventions necessary to obtain a specific novel result in a living organism, and provides new insight into the biophysics of cancer. Credit: Maria Lobikin and Michael Levin of Tufts University. Scientists from Tufts University’s School of Arts and Sciences, the Allen Discovery Center at Tufts, and the University of Maryland, Baltimore County have used artificial intelligence to gain insight into the biophysics of cancer. Their machine-learning platform predicted a trio of reagents that was able to generate a never-before-seen cancer-like phenotype in tadpoles. The research, reported in Scientific Reports on January 27, shows how artificial intelligence (AI) can help human researchers in fields such as oncology and regenerative medicine control complex biological systems to reach new and previously unachievable outcomes. The researchers had previously shown that pigment cells (melanocytes) in developing frogs could be converted to a cancer-like, metastatic form by disrupting their normal bio-electric and serotonergic signalling and had used AI to reverse-engineer a model that explained this complex process. However, during these extensive experiments, the biologists observed something remarkable: All the melanocytes in a single frog larva either converted to the cancer-like form or remained completely normal. Researchers also hope to extend the approach to other aspects of regenerative medicine by discovering interventions that help reprogram tumors, kick start regeneration and control stem cell dynamics. Levin noted that taming physiological networks like the one responsible for melanocyte conversion will require increasingly complex computational and mathematical modelling techniques and data representation, as well as new laboratory techniques in order to increase the ability to quantify information in vivo, especially in human patients.